Did you catch the Knights of the Eternal Throne announcement live at New York Comic-Con? If not, you’re in luck, as Community Manager Eric Musco has graciously filled fans in on the major bullet points of the announcement that weren’t apparent in the shiny (and long) trailer. All 9 Chapters are being released with Eternal Throne’s launch. What we said is that after KOTET’s launch, the team is refocusing on group content. Our hope is that as a part of the January Producer Letter or Livestream, we will have more specific updates on what is to come. This includes all types of group content, but was a specific answer to the question of Operations. We will have a whole bunch of livestreams and blogs between now and launch to go into details on many facets of the expansion. Dark vs Light is intended to end with KOTET Early Access on November 29th. However, I believe the Dark vs Light part of it to decide which Companion will be awarded, will end a week or so prior to that. PvP / GSF – Refer to answer above about Operations // stream in January. 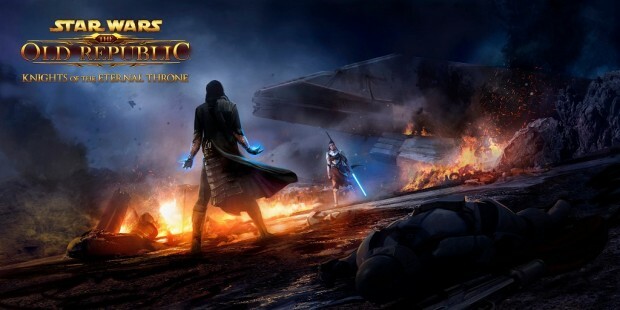 In addition to doing an all-at-once approach, unlike Knights of the Fallen Empire, which doled out content monthly, it’s interesting to see the dev team “Refocusing on group content.” SWTOR’s done a good job of capturing that single-player RPG experience, but the group aspect of things seems to have been lacking for some time now. In another thread, Musco promises “livestreams and blogs to explain elements of KOTET,” so we’ll keep you informed on any further announcements. Not even f2p. paywall game, giving u a demo,stop covering it geeez.